Granlibakken offers plenty of Sierra terrain to explore. 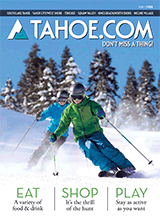 Enjoy the trails around Granlibakken's 74-acre resort or head up to Paige Meadows to experience Tahoe's back country. Guests have easy access to popular cross-country trailheads which provide miles of ungroomed Lake Tahoe skiing and snowshoeing terrain. Equipment rentals are available at our rental shop. Our warming hut is open 7 days a week to help keep the chill off.